You are currently browsing the Gluten Free For Good blog archives for June, 2009. Those of us on the Farmer’s Market or CSA circuit here in the Rocky Mountains are being bombarded with seasonal greens right now. My goal is to eat everything – no waste, no carting stuff off to the compost pile. I’m on a mission, but my gosh, these pesky greens aren’t making it easy. Plus, I got all caught up in the whole “victory garden” thing and had to plant a few of my own veggies and herbs. First off, when you live a short distance from one of the best organic farms in the country, with farmers who’ve been growing fresh produce for decades, why would I want to bother with doing this myself? I have so little free time as it is and to spend it weeding and tending my nano-acre of produce seems silly. Having said that, I’m thoroughly enjoying my dozen or so plants, even though my lettuce bolted and my rhubarb got hail damage. I have more weeds than produce and something is snacking on my veggies when I’m not around. This is a good lesson (well, sort of, the weeding part I could do without). I have a tendency to be very picky about what I eat and have a basic list of things I find important when choosing my food. Freshness, organically grown, seasonal, as local as possible (I do cheat though, my addiction to Fuji apples trumps all else). But I like knowing where my food comes from. Whoa, all that’s well and good until I actually tried growing that food I’m so darn picky about. 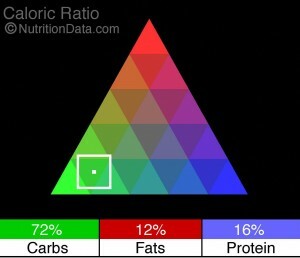 Please see my food pyramid remix list of healthy eating tips for details. Bottom line? Growing organic food is not easy and wasting it is bad karma. 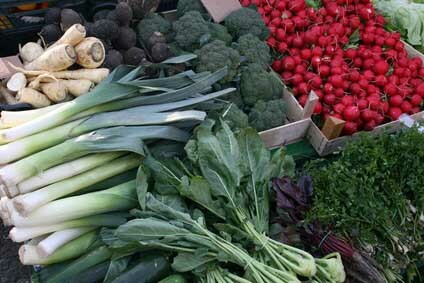 But, discovering new ways to use farm-fresh ingredients can be a delightful, healthy and rewarding experience. From garlic scape pesto to dairy-free beet ice cream, I have a ball playing with my food. And to be honest, I’m thrilled to have someone else growing it for me. It’s also less expensive in the long run. Now, on to those pesky greens. One more thing (always), please keep in mind that most of my recipes are just plain my way of messing with food. I don’t follow rules well and I don’t measure things, so my recipes are guidelines. I make stuff up, so beware. Prepare pasta per directions, but cook a couple minutes less than indicated. Set aside. Heat oil in large skillet. Sauté onions and garlic for 2-3 minutes, add mushrooms, stir gently for another couple of minutes. Add greens and stir until partially wilted (it doesn’t take long). Remove from heat. Spread a small amount (maybe 1/3) of sauce into an ungreased baking dish (I used a large round dish, but a 11 x 7 x 2 size is typical). 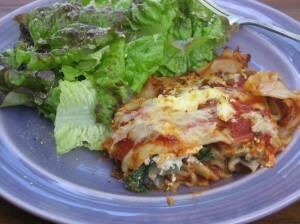 Layer half the lasagna noodles on the sauce and add a little more sauce. Spread the vegetable mixture over the sauce and top with dollops of ricotta, half the mozzerrela and some shredded parmasean. Add another layer of noodles and the rest of the sauce. 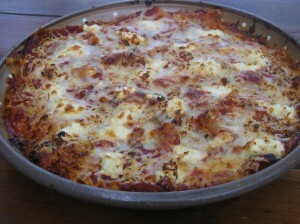 Top with dollops of ricotta, the rest of the shredded mozerello and parmesan cheese. Cover and bake in preheated 350 degree oven for 30-40 minutes. Remove foil for last 10 minutes or so to brown the cheese. Keep and eye on it so it doesn’t burn. Let sit for a few minutes to settle. This was absolutely delicious! 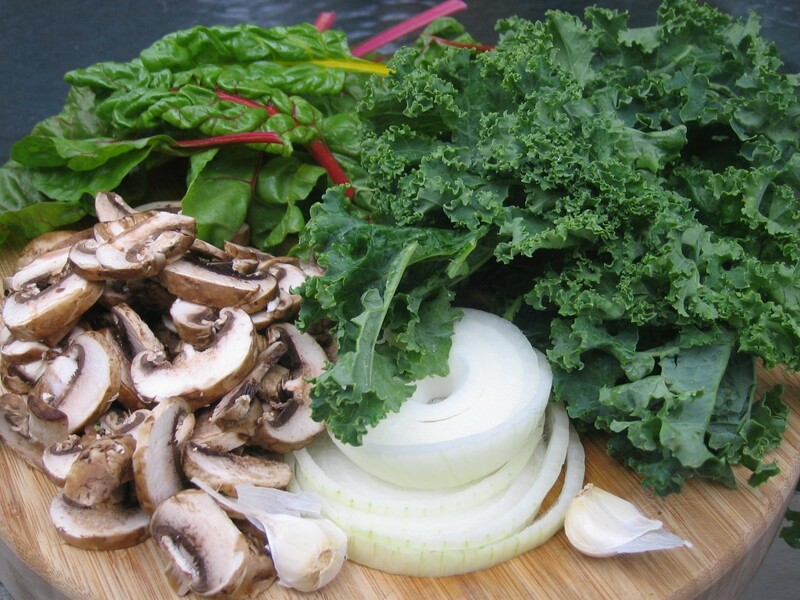 * You can use all kale or a mixture of any hearty greens (chard, spinach). They cook down quite a bit, so 7 or 8 cups of prepared greens really isn’t that much. * I mixed in the extra can of tomato sauce with the pasta sauce because I was afraid the one 25 ounce jar wouldn’t be enough and I was right. Go forth and eat your greens! And hug a farmer. P.S. 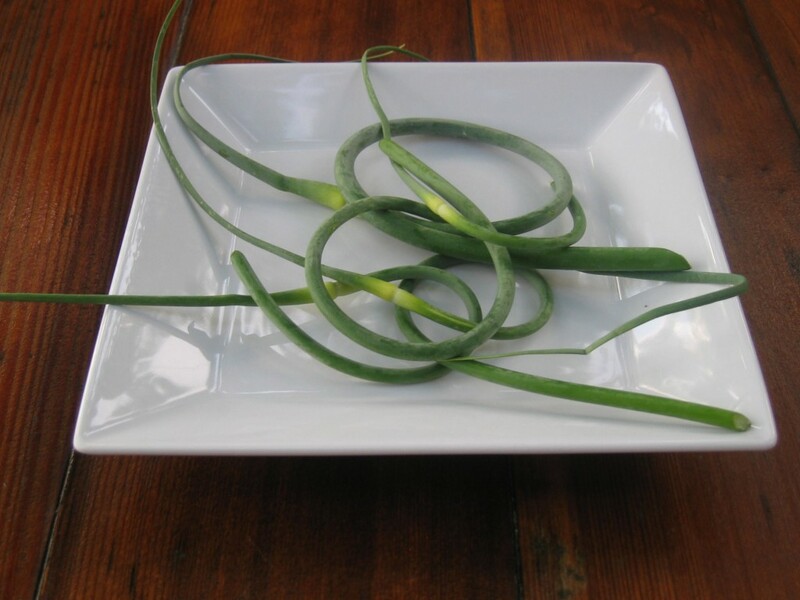 Stay tuned for a rhubarb recipe and another garlic scape creation. When your refrigerator is stocked with beautiful local greens and farm fresh eggs and you know you’ve got another load coming in a few days, you need to get creative with your meals. I’m eating kale, spinach, collard greens and lettuce in some form at almost every meal. Ah, but I’m not complaining. I’m a fan of a hearty breakfast for a variety of reasons. If you start your day with a nourishing mix of healthy carbs, good fats and quality protein, your energy levels stay balanced and you don’t crash an hour after eating (you know, the high-impact donut-dive). When you start your day with real food, you think better, feel better and have more energy. And without that creamed-filled donut and mega-grande latte, you probably look better, too. You’re also less likely to gain weight if you eat a nourishing breakfast. All good reasons. If you’re a CSA member and are being bombarded with greens, a hearty breakfast is a good way to chip away at the volume. 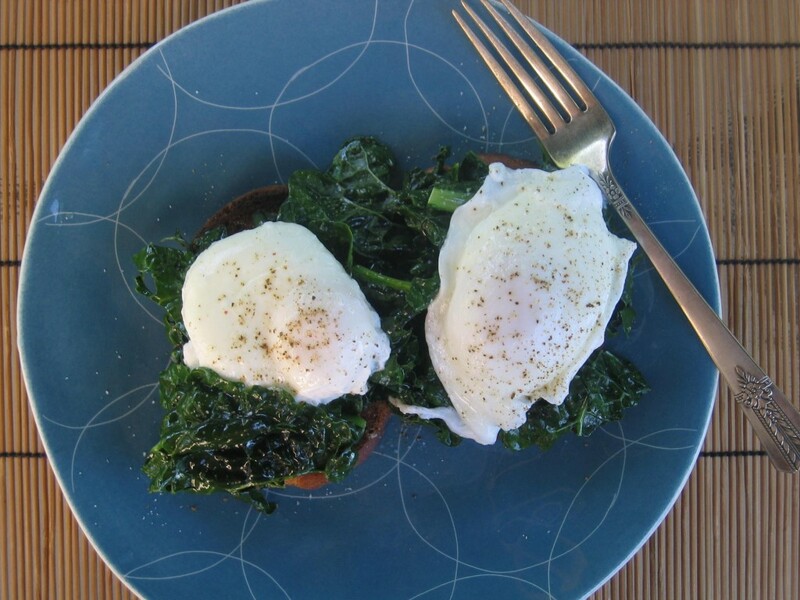 While greens are cooking, poach two eggs in a small pan of water and toast your bread. Layer greens on toast, top with poached eggs. Finish off with fresh ground pepper and salt. * I don’t eat bread very often, but there is nothing better than a poached egg on toast so I keep a loaf of gluten-free teff bread in the freezer. Teff is a powerful little grain; for more information, check here. * I have a year-round egg share from Grant Farms and can’t imagine eating store-bought eggs. Seriously, there’s a HUGE difference in taste and quality. Plus, I like knowing my eggs come from hens living in style at the bird spa. Check here for detailed information. * I always have a good-quality home-made or store bought broth in my fridge for sautéing veggies. It’s a healthy way to cook greens and great for making rice. 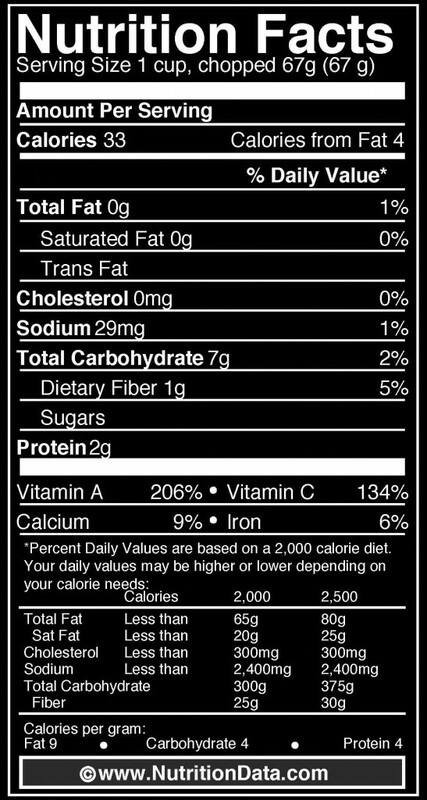 Here’s a nutrition profile for kale, courtesy of Nutrition Data. It’s good stuff. Go forth and eat a hearty green breakfast! Eat all your wholesome CSA or Farmer’s Market power food and you’ll be dancin’ in the streets like this guy. I’d suggest you tell your kids that if they eat their veggies they’ll be able to do stuff like this — but then again, it might happen and you’d be stuck with a kid who does stuff like this. Yikes! Go forth and eat your power veggies. Stay tuned, I’ll post a “hearty greens” recipe tomorrow. This one’s just for fun. What do you do with a zillion heads of lettuce (not to mention kale and collard greens)? I picked up week #2 of my Grant Farms CSA delivery last night and am inundated with greens. Ohh, I’m not complaining. Trust me, this is farm-fresh heaven. But I made a promise to myself (and St. Isidoare, the patron saint of farmers) this year to use every last lettuce leaf and not to let any of this fine food end up in my compost pile. We need to start with proper storage. 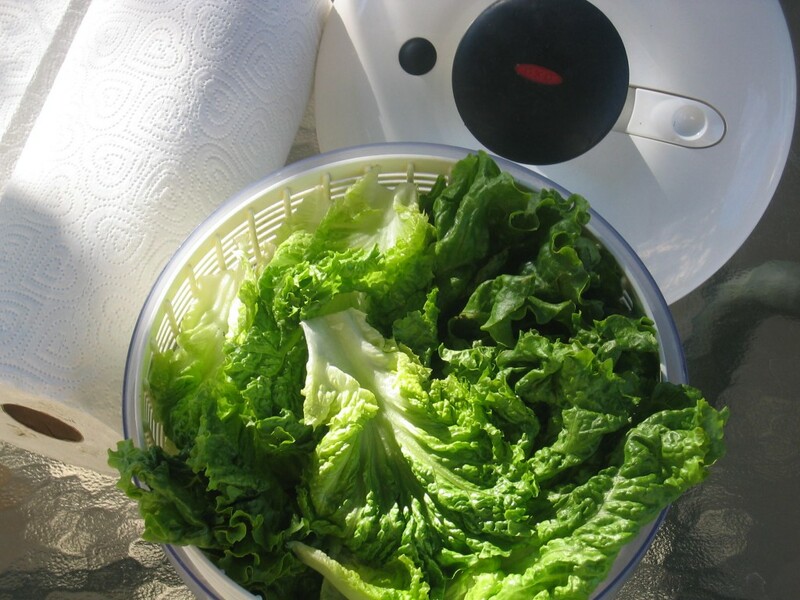 First off, if you’re going to jump on the CSA bandwagon, get yourself a good salad spinner. I love my OXO brand, but it wasn’t cheap (well worth it though). Wash salad greens well. It may take two or three rounds. Save the wash water and use it on your plants. They LOVE murky green water. Fill with greens and water. Swish, swish, swish (water plants) and spin dry. Drying is just as important as washing as your dressing won’t adhere to the leaves if they’re wet. Plus, it doesn’t store well if it’s too damp. 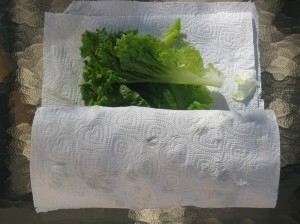 Using either a lightweight kitchen towel or a paper towel, lay the washed and spun-dry lettuce out on the towel and loosely roll it up, burrito style. 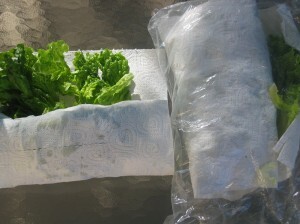 Place in plastic bag and store in your refrigerator crisper. It should last up to a week or more. * This is a launching pad recipe, add whatever you want. If you want a little protein, add a scoop of chia seeds. Blend and serve! Adjust amounts depending on the number and size of servings. 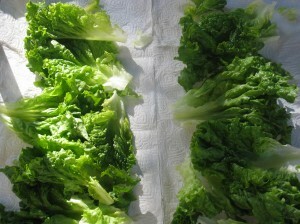 Go forth, wash and dry your greens and feed them to your kids in smoothies! Last week’s Grant Farms CSA box included dill and parsley, along with a bunch of other green and red goodies (see past two beet recipes). This post will focus on the herbs. I’ll be brief and spare you the geeky details. I almost promise. However, my enthusiasm for the healing power of food might trump your eye rolling (I have a Mac with spy capabilities, I know when you’re making faces). Dill — has a clean, faint lemony smell and taste to it; with a hint of anise or fennel. Freezing preserves the flavor better than drying, but either work well. You can freeze dill whole in a plastic bag and cut off little sprigs as needed. Add dill at the end of cooking as it loses its flavor if overcooked (thanks chef Miles). Dill goes well with beets (yeah), cucumber, tomatoes, potatoes, fish and seafood, rice, egg salad, spinach, zucchini, carrots, cauliflower, celery root, cabbage, salad dressings. The volatile oils in dill make it a “chemoprotective” herb. It helps neutralize certain carcinogens (cancer causing agents). It’s also a good source of calcium and iron. Calcium? Surprise, surprise. Parsley – is a bit like dill, but with a tangy hint of pepper. It’s one of the most versatile herbs and is essential to several flavoring mixtures (French bouquet garnis, fines herbes, salsa verde, tabbouleh). It combines well with basil, bay, capers, garlic, marjoram, oregano, rosemary, tarragon and can be used with most vegetables. I love it with tomatoes, rice and fish. This one’s a nutritional powerhouse. Seriously, don’t take it for granted and don’t leave that parsley garnish on your plate. Eat it! It’s an excellent source of vitamins K, C, and A, is a good source of folate and iron, and its volatile oils put it in the same chemoprotective category as dill. Combine olive oil and honey Dijon mustard in medium sized bowl. Whisk until well blended. Add the rest of the ingredients with the exception of the pasta and the salt and pepper. Blend well and let sit at room temperature for at least 30 minutes. When ready to serve, add the salt and pepper and toss with prepared hot pasta. Makes about 4 servings. 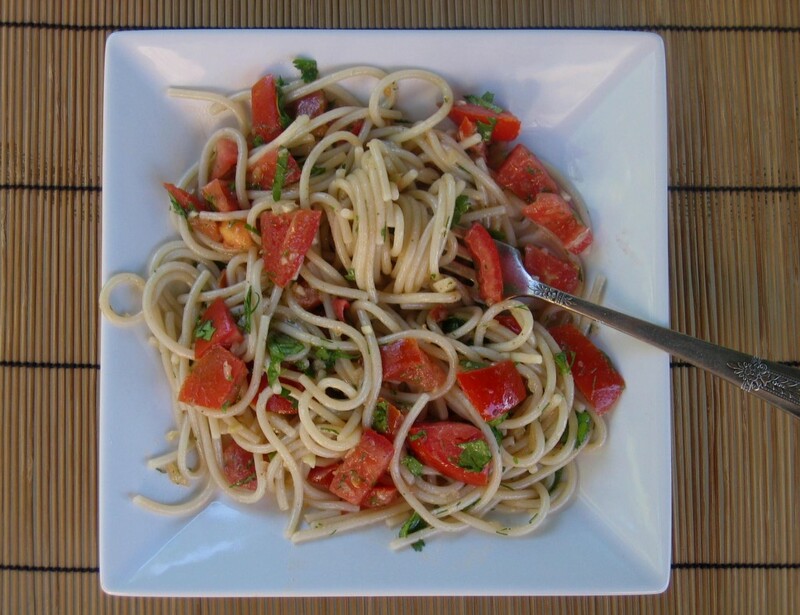 This can also be made into a cold pasta salad. 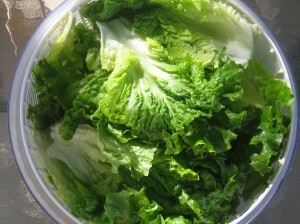 I had some leftovers, which I refrigerated and served the next night (reheated) over a big plate of the fresh leaf lettuce from the CSA delivery box. It sounds weird, but it was delicious! Go forth and hug your CSA farmers. But if you do, definitely don’t eat it in front of anyone you’re trying to impress. Your teeth will be the color of a Barbie Glamour Gown. I was inspired by Ali of Whole Life Nutrition to try my hand at making ice cream. Lilly’s bunny bowl full of fresh strawberry ice cream was too tempting to ignore. The fact that I didn’t own an ice cream maker did nothing to curb my enthusiasm. I’ve been saving a 20% off coupon from Bed, Bath & Beyond for something like this and figured it was time to give Ben & Jerry a run for their money. No vanilla, chocolate or caramel pecan for me. Nooo way am I going to start my ice cream making career with something basic like that. I’m also on a mission to use everything I find in my Grant Farms CSA box each week. No waste, I’m determined to creatively use every last lettuce leaf. So far, so good, although I’m only 1 week into the 26 week harvest. Last week’s bounty included several fresh herbs, French breakfast radishes, butter lettuce, green leaf lettuce, kale, spinach — and baby beets! Hmmm? 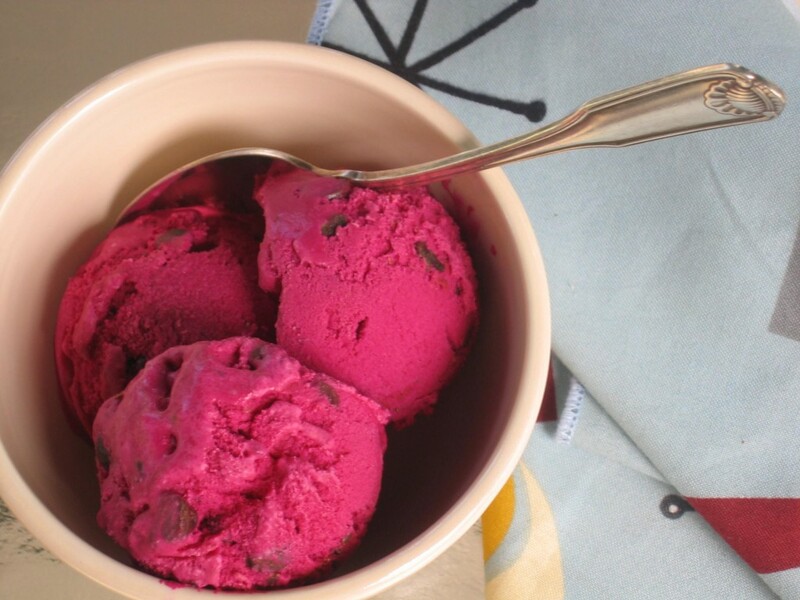 Beet ice cream? Sounds better than kale ice cream. 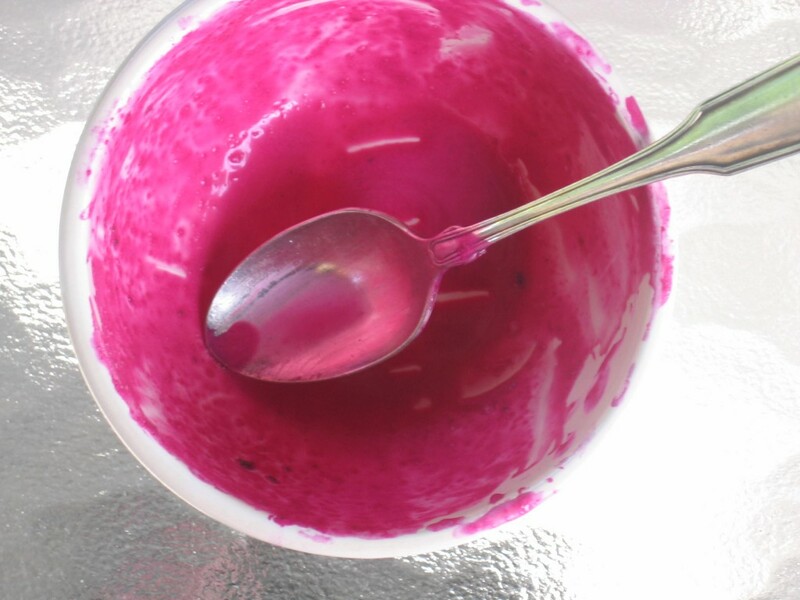 I figured no one had ever tried this before — until I googled “beet ice cream” and found that Todd and Diane at White On Rice Couple had a recipe for it and so did Michael Symon of the Food Network. Who makes beet ice cream? That’s down-right weird. Although they both looked good, I wanted to try it dairy-free and both recipes used cream. Uh, it’s ice CREAM, why would it be dairy-free? White On Rice Couple have a beautiful food blog stocked with recipes made from healthy, fresh, local ingredients. Plus, they’re just plain groovy people. Check them out. Back to the task at hand. Dairy-free, beet ice cream. I knew I was going to use coconut milk for the cream substitution (that’s a basic for me), but I had no idea what else to do, so I went back to Ali’s ice cream recipe for inspiration. I can always count on Ali and Tom to come up nutritious, tasty and simple recipes. For a complete cooking guide to healthy fare, check out their Whole Life Nutrition Cookbook. It’s wonderful! I blended the coconut milk and maple syrup in my blender until mildly frothy and stored it in a large glass bottle in the refrigerator. My CSA delivery had a bunch of small baby beets – I had to add 6 larger beets to the mix. Trim the stems, scrub well and roast the beets in a 400 degree oven for about 45 to 60 minutes. I added the smaller ones half-way through the roasting process. 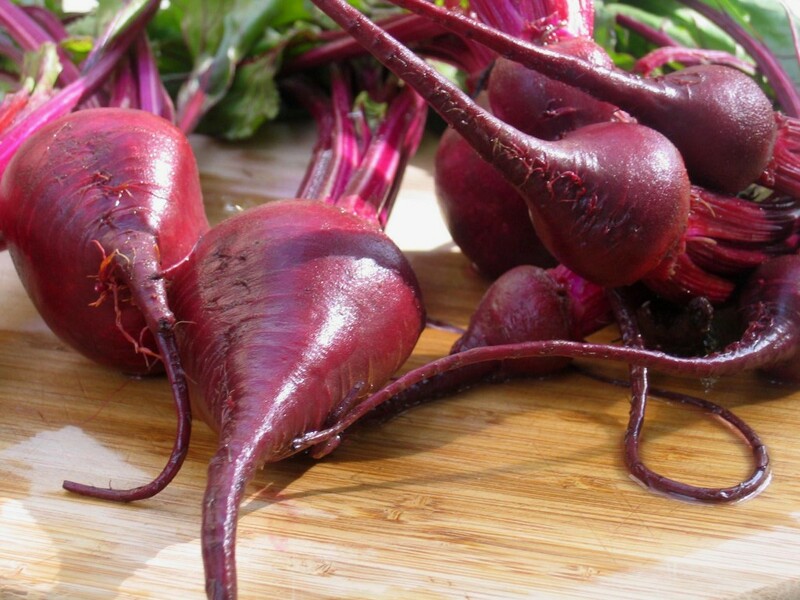 For more information on how to roast beets, check here. (Next time, if there is a next time, I’m going to skip the roasting and use raw beets.) Let cool, trim ends, cut into chunks and run through a juicer or vita mix. I ended up with almost two cups of juiced beets. Blend all ingredients in mixer until creamy. 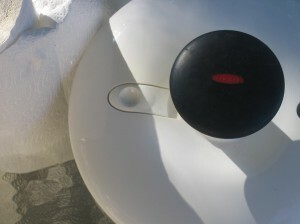 Pour the mixture in the ice cream maker per manufacturer’s directions. I churned the ice cream for 25 minutes, then added the chocolate chips and churned it for another 5 minutes. Place in the freezer for several hours while you clean up the fuchsia mess that was once your kitchen. Eat alone and don’t smile. As you can see, I liked it. A lot. And no beety taste – seriously, you would never know it was made from a root vegetable. P.S. Who wrote the song – The Beat Goes On? And when? The beet is the most intense of vegetables. The radish, admittedly, is the more feverish, but the fire of the radish is a cold fire, the fire of discontent not passion. Tomatoes are lusty enough, yet there runs through tomatoes an undercurrent of frivolity. Beets are deadly serious. Do you ever read something you wish you had written? Something so well-crafted, so simple, yet sublime? That’s how I feel about the above paragraph. I should have written that. I’m the one obsessed with beets, born with an affinity to Rasputin’s favorite vegetable. No one understands beets like I do. Of course, good writing and a passion for beets are two distinctly different things. Even if I have to let Tom Robbins say it for me, I’m content knowing I’ve chosen the most torrid of all vegetables as my favorite. Trust me, carrots, celery, even burdock root are no match for the wild and impassioned beet. I belong to Grant Farms CSA program and yesterday was my first delivery of 26 weeks worth of organic vegetables, fruits and farm fresh eggs (I have a year-round egg share). Those of you who have been following this blog know I border on ardently evangelical when it comes to my local farmer friends and their freshly-harvested, seasonal produce. I opened my CSA box last night and inside I found a bunch of deadly serious beets. Need I say more? Preheat oven to 400 degrees. Trim beets and save the leaves; please don’t throw them away, they are wonderful (see link below). Scrub the beets and place in a glass baking dish. 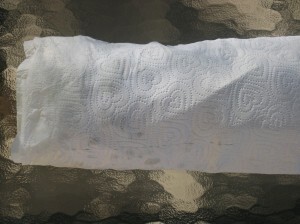 * Pour about an inch or so of water into the dish and cover with foil. Roast for about 45 to 60 minutes depending on the size of the beets and the “heat” of your oven. Carefully (don’t spill the HOT beet water) remove beets from oven, set aside and let cool. Save the beet water for making smoothies. Seriously, let it cool and store it in a glass jar in the fridge – it makes for wonderfully healthy smoothie juice. In the meantime, using a small bowl, whisk together diced garlic, shallots, lemon juice, Dijon mustard, agave and olive oil. Season with salt and pepper. I usually put the mixture in a glass jar and shake like crazy. Shake, shake, shake your booty. Arrange spinach on plates, top with beets, chopped pecans and crumbled goat cheese. Drizzle with dressing. * I have a Le Creuset enamel-covered, cast iron French oven with lid that I use for roasting beets. It’s wonderful, but the above method works as well. I’ll be posting weekly nutrition information and recipes depending on what Andy and the gang put in my big red Grant Farms CSA box each week. Stay tuned and leave a comment if you want ideas, help or information about farm-fresh food. Sign-up for emailed updates so you don’t miss anything. Lets put it this way – I’m counting on my friends at Grant Family Farms to grow most of my food for the next 26 weeks. I can come up with creative ways to prepare fresh food (again, with a little help from my friends), but I’d starve if I had to rely on my own wimpy garden to get me through the summer. 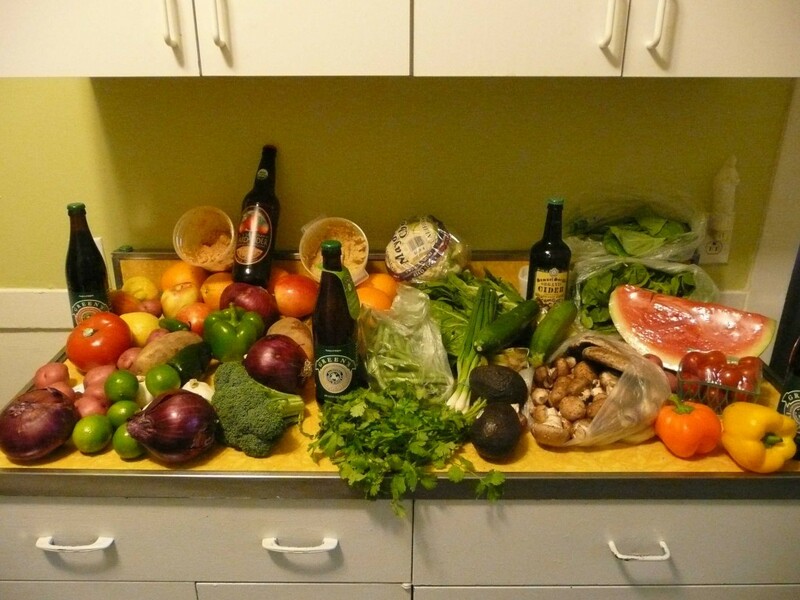 My CSA delivery starts next Monday and I’ll be posting weekly recipes according to the harvest. Stay tuned. In the meantime, I’ve been watching my little organic garden thrive in spite of my dog’s initial digging interest, the recent rain and hail we’ve had and a few overly enthusiastic wild bunnies. 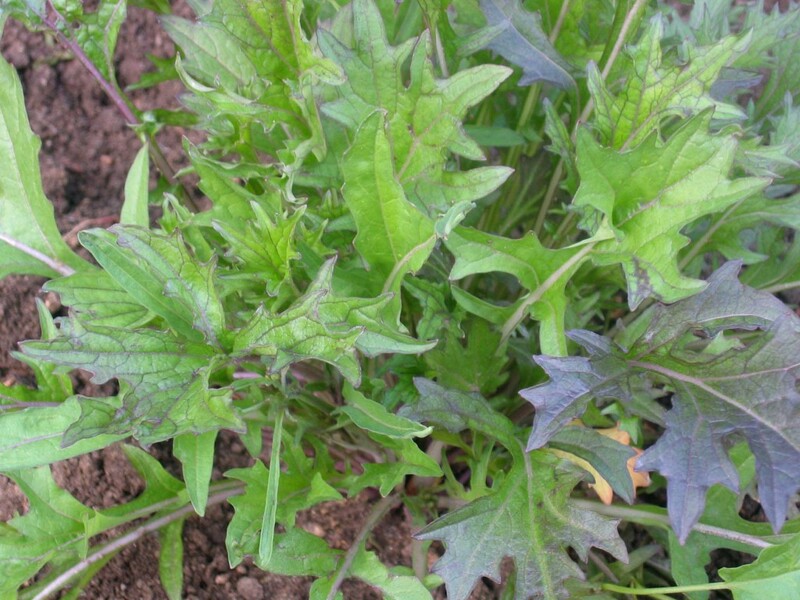 The photo above is of one of my four purple mizuna plants. My micro-victory garden is .00229568415ths of an acre. Seriously. Urban gardening at the nano-level. I didn’t make that number up, I actually figured it out. Of course, I could be totally wrong. It’s not like I went to MIT or anything. Within seconds of square feet conversion calculating, I was having synapse spasms, but I pushed on and I think I’m right. Although I won’t have much of a “harvest” per se, working my little .002295-whatever of an acre has been very rewarding. I’m feeling like quite the little farmer-ette. Today I made a wonderful mizuna salad for lunch. I walked outside, clipped off some leaves and made my lunch. Oh my gosh, I love that feeling. Zena, Farmer Princess. Purple mizuna is a Japanese salad green that I find to have a mild earthy taste. Maybe it’s a mild spicy taste. Or a mild peppery taste. I can’t really identify it. * Cid, can you help me with this since you’re the expert on all things Japanese? What does it taste like? Other than good. I made this up with ingredients that were sitting on my counter and it turned out delicious. The fresh cherries, dates and walnuts made this mix a winner. Crumbled goat cheese or feta would be a nice addition. Go forth and grow your own greens! *Thanks Kay, for all your gardening tips and guidance. Kay is a blogger friend who is a master gardener, composter extraordinaire, worm rancher (or something like that), chicken herder and all around hard-working farm girl. She’s my gluten-free garden guru. My twenty-something daughter and I both have celiac disease, although it’s much easier for me to manage since I have virtually no social life compared to her. I’m not complaining as the thought of going out partying until all hours of the night borders on horrifying to me, but when you’re young and living in a groovy city like Chicago, maintaining a healthy (and fun) gluten-free lifestyle can be a challenge. I just spent the past few days in Seattle at the Gluten Intolerance Group’s national conference. Part of the professional track focused on the pathology and treatment of celiac disease and what’s in the future for drug therapies. I’m passionate about increasing awareness and am thankful for the research taking place and the new product development that has made GF living so much easier now than it was a decade ago when I started on this path. Having said that, the photo above sums it all up for me. Eat real food – wholesome nourishing food – and not only will you heal and thrive, you won’t have to stress yourself out reading cryptic food labels or risking gluten contamination. Tevis (my daughter) took this photo last week to prove to her nutritionist mother that she’s eating well and taking good care of herself. I was thrilled with her food choices until I heard she was carting all this stuff home from the market on her custom-made bike. Winding around in city traffic. While wearing work clothes. Knowing her, she probably had on a skirt and her Jackie O sunglasses. When I was younger, I always wanted to raise colorful, creative, adventurous kids. That’s all well and good until you actually have kids like that. Probably not. Thank God I don’t know. And where is up here? They owe me big time, even though I have a good idea where some of this behavior came from. My mom says I got exactly what I deserved. Here’s her picks for the best gluten-free beer and cider options. What are your favorites? P.S. Be safe and make smart choices (my “mom” mantra).